Swanica finds a connection with Mother Nature and meaning of life through the creation of ceramic art. Her pieces radiate the warmth of earthenware colors, and express the elegance and harmony of nature through her designs, the interplay between line and form, and surface treatment. Her interests lie in low-fire techniques, what gives her a great color palet with clays, slips and glazes. Swanica was influenced by a long family tradition of goldsmiths, painters and musicians and historical education. She became immersed fulltime in the ceramic art world in 1981 at the “L’Ecole des Arts Decoratifs” in Geneva, Switzerland, where she was educated in the art of drawing, throwing, forming, decorating and glazing ceramics. Her early works include a study of Mexican figurines as well as “Delft Blue” ceramic ware. The “Honorable Mention” Award for the “Duo Ferric Horsehair Box set” at the 10th Mino International Ceramics Competition 2014. 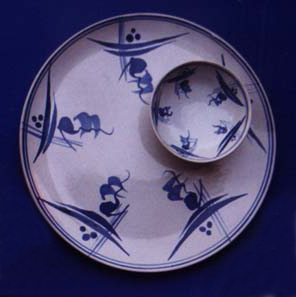 The “Commendation Award” for the “Circles of Life” Horsehair Plate at the International Ceramics Competition Mashiko 2008. They chose the "Circles of Life" Horsehair plate, but they put the “Arsia Caldera” in the exposition with the under-title “Circles of Life”. So, I consider them both accepted. The “Honorable Mention” Award for the “Cosmos” Horsehair Plate at the 8th Mino International Ceramics Competition 2008. The “Special Judges’ Award” for the “Four Seasons” Horsehair Vase at the International Ceramic Arts Competition Mashiko 2006. The “Star Award” for the “Red River Tripod” at the Art Museum of San Jose, California with the Silicon Valley Open Studios in May 2005. Jingdezhen: In the Jingdezhen Ceramic Museum, China, 2009. Shanghai: In the Shanghai “Pot” Museum, China, 2010. Yixing: In the Yixing Ceramic Art Museum; in their special exhibition hall for international teapots., China, 2011. Jakarta: In the Museum Seni Rupa dan Keramik, Visual Art and Ceramic Museum in Jakarta, Indonesia, 2013. The “Greek Vase” and “Red River Tripod” accepted in the juried show in the Olive Hyde Gallery organized by the OVCAG organization in Fremont, California in 2004.